Light Expanded Clay Aggregate, ECA or LECA is a round pellet structure produced by firing natural clay at temperature of 1200°C. The result is a hard, honeycombed structure of interconnecting voids within the aggregate. The particles formed are round in shape and generally range in size from 0-30 mm. These are processed to the required grading, depending on the versatile applications. When the inter-granular voids (voids connecting with one another) are immersed in water they immediately become saturated. 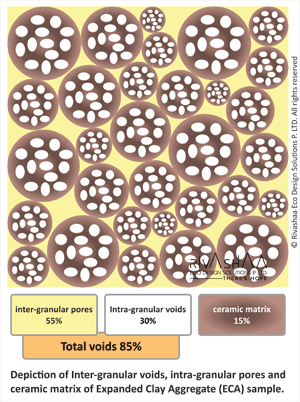 The intra-granular pores (Voids within each aggregate) only fill slowly with the water by capillary action and some of them will never become saturated. This results in excellent drainage capacity property of Expanded Clay Aggregate (ECA, LECA) due to the network of inter granular pores whilst intra-granular pores helps for water absorption. European Standard EN 13055-2 signifies the coefficient of water absorption of Expanded Clay Aggregate known as ECA or LECA by immersion of dry clay aggregate in water for 24 hours. Comparison of its weight before and after test (post drainage) gives the quantity of water that has been absorbed by the granules (results vary depending on the grain sizes of 0-30 mm). The Expanded Clay Aggregate also known as ECA or LECA have a lightweight internal cellular structure with good insulating properties which is enclosed within a compact and strong external shell which provides an excellent weight-strength ratio making the aggregate absolutely suitable for versatile applications including major use in Landscaping, Geotechnical, Construction and Infrastructure applications. ECA is 100% inert, vitrified, dimensionally stable material whose volume remains unchanged in contact with water. ECA is reusable and recyclable. Expanded Clay Aggregate (ECA) being a frost and fire resistant material is also a thermally insulating and sound absorbent product. Expanded Clay Aggregate (ECA) is the only light weight aggregate certified for geotechnical uses and is marked compliant with EN 15732 (Lightweight fill and thermal insulation products for civil engineering applications (CEA) by CE). Landscaping Roof Terrace Gardens, Planters, Vertical Garden, Turfs, Sports Fields, Agriculture, Horticulture, Hydroponics, Urban Trees and the like. Construction Blocks, Wall panels, RCC, PCC, Aggregate Mortar & Roof Tiles for Sound and Thermal Insulation, Plastering, Flooring, Back fill and Drainage use. Filler material for Sound Transmission Class (STC applications). Lightweight High Strength Structural Concrete, Designer Concrete applications, Acoustic Panels, Cladding Stones, Cladding Panels, Coatings, Paints, Precast and Prefab Industries, Thermal and Sound Insulation Concrete and Mortars, Landscaping, Agriculture, Horticulture, Construction Blocks and Tiles, Plastering, PCC, Waste Water treatment, Petrochemicals Oil and Gas Bedding Insulations, Geotechnical applications including lightweight backfill, Sunken Fill and Road/ Embankment Construction. The versatile application of Expanded Clay Aggregate in Geotechnical field includes construction of embankments/fills, Lightened embankments, Bridges abutments and alignment ramps, Embankments on landfill, Embankments on potentially unstable slopes, Containment structures ( Retaining Walls, Piers and waterfronts ), Foundations of buildings, Fill for underground structures, Buried tanks and pipes, Fill for below-ground cavities, water management including infiltration reservoirs, drainage and green roofs, Road construction, Landscaping, Landing beds and roofs for rock fall protection, lightweight structural and non-structural concrete and the like.